Tavish's father died when he was just a small boy. His death not only created a hole in their family unit, but it plunged them into a state of financial crisis. Tavish worked alongside his widowed mother. Like this woman pictured, Tavish's mother laboured in fields to keep her family alive. Much of Tavish's childhood consisted of trying to make ends meet, but he came up dry. Sometimes crops didn't produce enough, and this caused one financial tragedy after another. When Tavish grew older, he married, and he and his wife were blessed with two children. Tavish continued to labour in fields around his village with barely anything to show for his backbreaking work. It was as if all his efforts were one single drop in the midst of a vast ocean of needs and wants. Though Tavish was doing all that he could by working multiple jobs, he felt helpless to provide for his family and mother. He never gained ground on their desperate poverty. He was then faced with a difficult decision: Stay in their village and watch his family starve, or deprive his children of education and a stable home to keep them alive. Tavish and his family, like many in his region, traveled to a neighboring country to live and work for six months out of the year, in sugarcane fields.2 The conditions were primitive—no toilet facilities, no home, no privacy and no school. The future for his children looked as bleak as his own childhood. The toil of poverty slowly stole away Tavish and his family's peace and joy. Tavish (not pictured) worked from the time he was a young boy. Because of his family's poverty, he missed out on school. He worked hard to provide for his family, but all his efforts seemed like a drop in the ocean. It was during the off months of the sugarcane fields that Tavish encountered a glimmer of hope through a message of peace. GFA-supported pastor Naimish visited Tavish and his family one day to ask if they needed prayer and to offer encouraging words. Tavish shared his life story, marked by poverty and hardship, with the man of God. Pastor Naimish could see the family was burdened by the weight of survival. He shared with them about the One who gives hope and new life to weary souls. Tavish and his family felt truth penetrate their hearts. Faith in Jesus began to anchor the family, while a hopeful future stretched before them. A peace that poverty had stolen swooshed in as new life began to change Tavish and his family. The God who clothes lilies and keeps His eyes on the sparrow was taking care of this family, and they started trusting Him to provide in their lack. This is Tavish with his mother, wife and two children. They struggled under the grip of poverty for many years. The following year, Tavish was invited by Pastor Naimish to attend a GFA-supported Christmas gift distribution program. Through the love and care of people across the globe who had provided gifts through GFA's Christmas Gift Catalogue, Tavish and his family received a cow. As the cow grew, the family's joy grew along with it. It was providing more than four liters of milk a day, and they were able to make and sell ghee, a type of butter, each month. The profit they made from this liberated them from needing to face the harsh conditions of poverty. 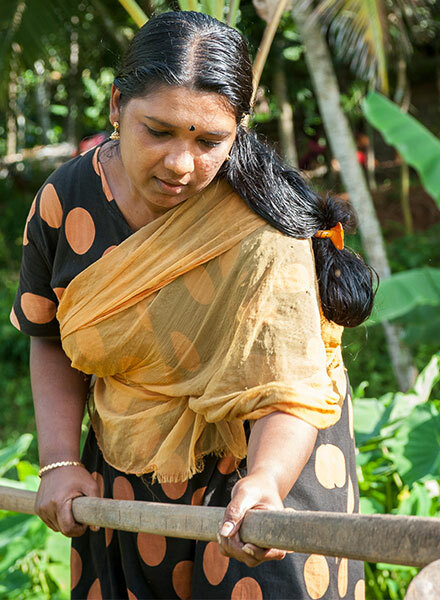 Because of this, Tavish's children were able to get a consistent education. Their future not only blossomed full of new life, but their new source of income also paved the way to escape poverty through education. 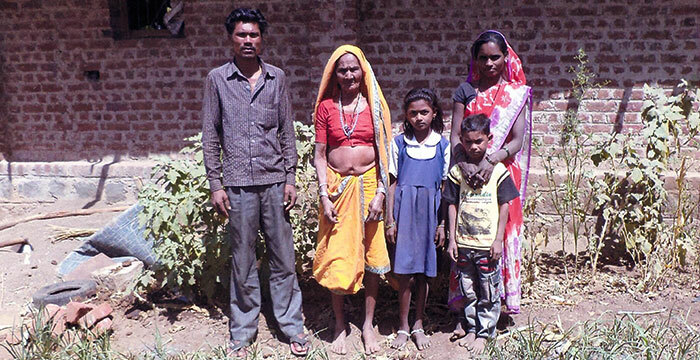 The family's joy doubled as their cow gave birth to a calf, and the income from these two cows relieved burdens the family carried for many years. "We came to know the true love of Jesus in our lives," Tavish said. "He has removed all our burdens and sorrows." 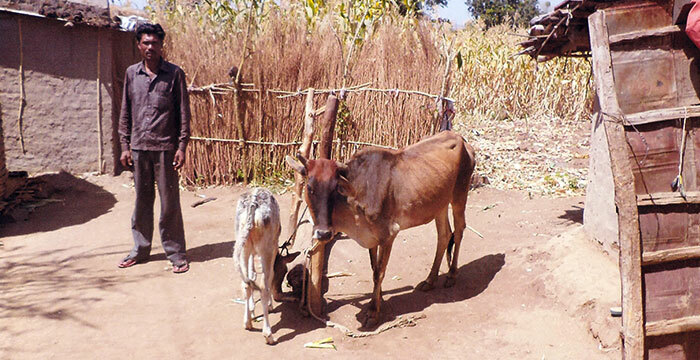 After Tavish received a cow through GFA's Christmas Gift Catalogue, his family's financial status improved greatly! They become doubly blessed when their cow gave birth to a new calf, providing more hope for their future stability. You can be part of delivering families from poverty's grip by providing an income-generating gift, such as a cow, for a family in need. This Christmas, give a gift of hope, and help blaze a path toward a promising future and a chance for new life!